Looking for something to break the exam stress, the holiday boredom, or just need something exciting to read? 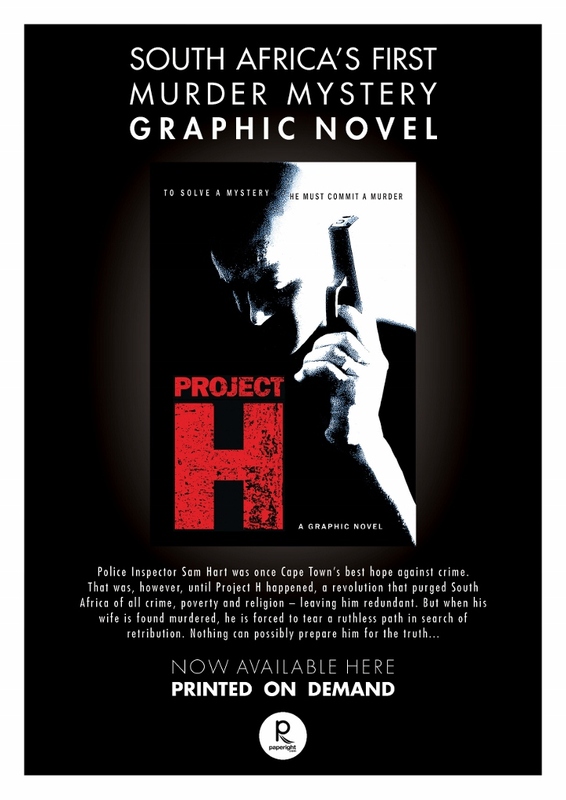 Project H is South Africa’s first murder mystery graphic novel, and it’s available to buy from Paperight. Lovingly illustrated and expertly written, Brandon Carsten’s debut book is a bonafide thriller. The story of a Capetonian cop made redundant in a utopian South Africa – a reformed country seemingly without crime, poverty or belief in God – who is forced to investigate his wife’s murder and the truth behind a nationwide revolution, Brandon Carsten’s debut book is set to be a hit for comic enthusiasts and newcomers alike. If you’re a Paperight outlet and would like a personalised version of this poster – or if you would like to give us suggestions for and comments on our outlet posters – please don’t hesitate to mail us at team@paperight.com. To sign up to our fortnightly outlet newsletter – featuring the best Paperight content and news, as well as posters for your outlet – simply sign up by clicking here! Next Next post: Need matric exam papers?